THAT TIME … We stayed in a little corner of paradise. The kids had no idea they’d be sleeping in a castle that night. The amazing building, the massive fireplace, the gorgeous indoor pool: they knew the place, but they’d only ever spent a few minutes there before. They longed to spend a night at the hotel … and one Sunday in July, their dream came true. Around lunchtime, we drove through the gates of the Fairmont Le Château Montebello, where Mommy said she was meeting a colleague (sometimes Mommy lies). Seated on the sunny terrace, we told all: we were staying overnight, and we were going to do lots of activities! Note incredulous expressions in the photo below. “This place is paradise” – Henri, age 7. It’s an enticing prospect, and we need to plan our strategy. We take a look at the summer schedule. Did you know that a myriad of activities is offered every day? From morning tai chi workshops to the evening bonfire, the challenge is deciding what to choose. The kids’ first pick is the elegant, near-Olympic-size indoor pool. A steaming hot tub awaits us. Daddy is in heaven. While the boys and I paddle around in the pool, my partner stretches out in a nearby hammock. 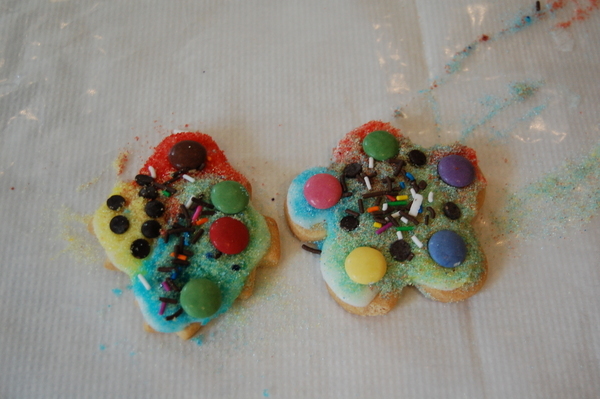 At 3 p.m., my eldest, a real sugar monster, reminds us about the cookie decorating workshop. Quick, out of the pool and off to the workshop! With the delicacy of a dump truck, the kids decorate their cookies with coloured sprinkles that-Mommy-never-buys-because-they’re-not-natural. Afternoon snack is all taken care of. Daddy appears, well rested from his snooze. We’re ready for a new adventure: bicycling! At the onsite Sports Chalet, we pick up everything we need. What bliss to cycle along a woodland trail without fear of being smashed by a vehicle … It’s a revelation. My partner and I promise to come back for more. The afternoon flies by, and the fine weather holds. After our bike ride, we borrow some golf clubs and balls for a crazy round of mini-putt. We’ve barely sunk a few birdies when suppertime rolls around. We take our seats at our reserved table on the terrace (with a beautiful view of the gardens and the river) and our server explains the BBQ menu. A few minutes later, the parents are sipping their glasses of wine while the children play on the lawn. We drink to world peace. After a leisurely meal, it’s movie night for the younger set. The day is done and we can’t wait for tomorrow! The weather forecast says “cloudy,” but that won’t stop us from exploring the hotel grounds. After the (delicious buffet) breakfast, we split up: my younger son wants to go to the pool, and his older brother wants to go jogging with Daddy. So be it. We meet up an hour later and carry out our latest plan: walk to the golf club for an introductory golf lesson. The walk is fantastic, along a little creek to the manicured golf course and luxurious clubhouse. Unfortunately, the skies open (hello, summer 2017!) 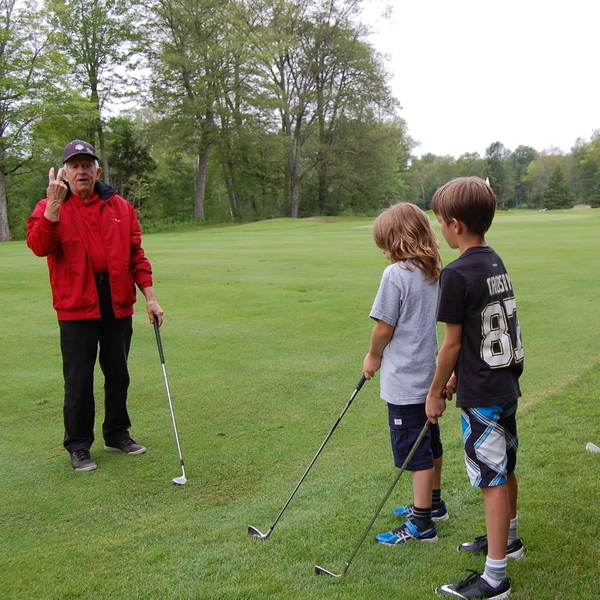 as Mr. Denis shows us the basics of this noble sport. After whacking a couple of dozen balls, we return to the château, soaked to the skin. Desolate, my youngest, like the Everly Brothers, is crying in the rain, but he cheers right up when I tell him it’s OK to go in the hot tub in shorts. Soothed by the warm, swirling water and dressed in dry clothes, we realize it’s already time to leave. No doubt about it, we’ll be back! We want to try canoeing, tennis, stand-up paddling, the photo rally, tai chi, croquet, the scavenger hunt ….